Amherst was not always an agricultural community. Before it was settled by English immigrants, the land in and around Amherst was likely the hunting grounds for Native American peoples. The history of traditional agriculture began in earnest in the 1700s when the English residents of Hadley used Amherst for pastureland. With somewhat inferior soil to the lowlands of the Connecticut River Valley, Amherst's land was better suited for the grazing of livestock. Like most of New England during that time, sheep were the predominant grazers. In 1845, there were 2,054 sheep, 1,668 cattle, 625 swine, and 336 horses. Each year those sheep produced two to three tons of wool. In addition to the typical crop of corn, settlers eventually began to sow rye, oats, barley, and flax as staple grains. Later, peas, beans, and pumpkins were introduced as more profitable cash crops. It was not until the 1800s that potatoes were found growing in Amherst. Legend has it that our neighbors in Pelham had to be called upon to teach locals how to successfully harvest this crop. 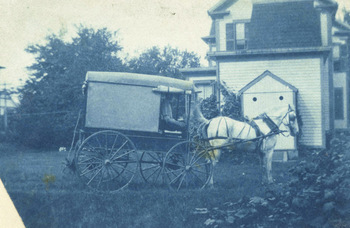 Though much celebrated today, Amherst's agricultural history began in the ordinary way, as the basic means for the early settlers and their descendants to make a living. The Town's commitment to farming was institutionalized in the 1863 establishment of the Massachusetts Agricultural College, a bastion of "Scientific Farming" which over time became the flagship campus for the University of Massachusetts. When the University expanded during the late 1960s/early 1970s, the sudden increase in student and staff population led to rapid residential growth. This caused Amherst to launch a concerted effort to save its farmland before it was lost to development. In addition to helping long-time farm families remain in business, the success of these ongoing farmland conservation efforts has in turn inspired and made possible a wave of organic and community-supported-agricultural (CSA) operations. Hampshire College is a unique catalyst for this movement, not only by encouraging a combination of agrarian and ecological studies, but also as the host for one of the largest annual organic conferences held by the Northeast Organic Farmer's Association. This article was originally published on the Conservation Department, Town of Amherst website.